We had a very enjoyable stay at the house. 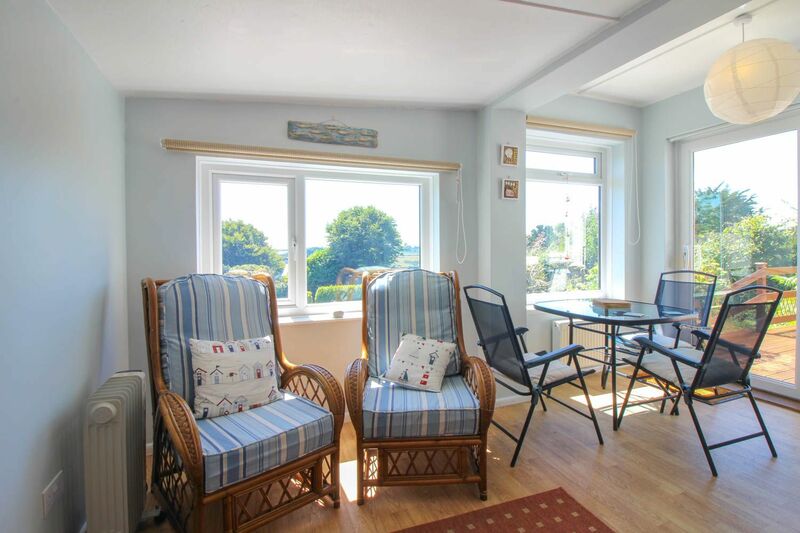 The views from the conservatory were lovely, and we enjoyed having our breakfast looking at the small boats moored in the harbour in the early morning light. 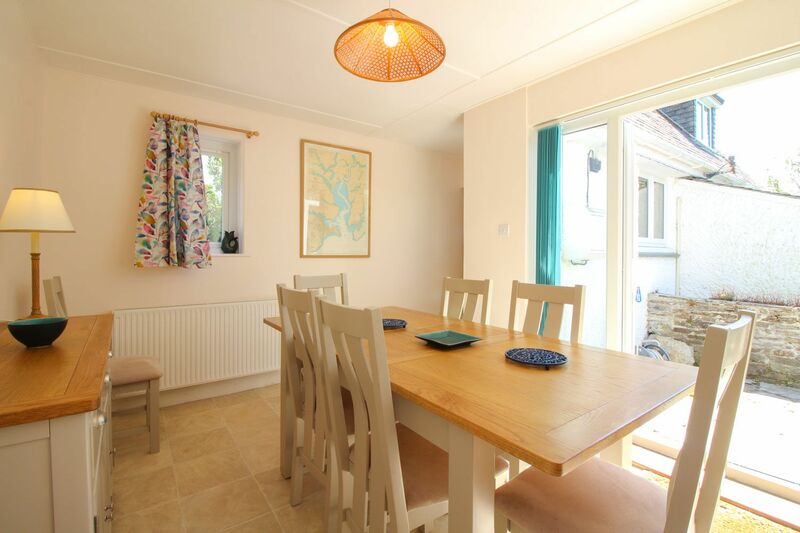 The kitchen is well equipped and attached in the front is a newly added, bright dinning room with seating for eight people! We both liked this room and it was great when cooking to be able to carry the food on to the table straight off the cooker. 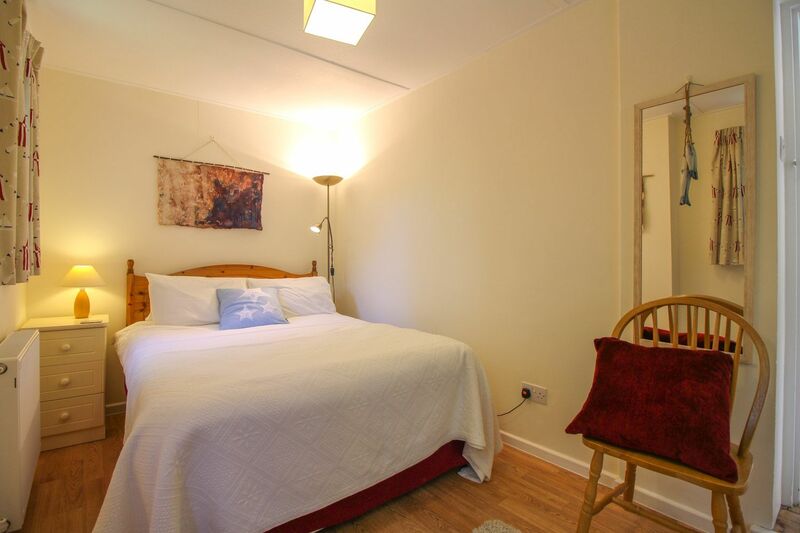 The bedrooms were clean and bright and there is ample parking space. 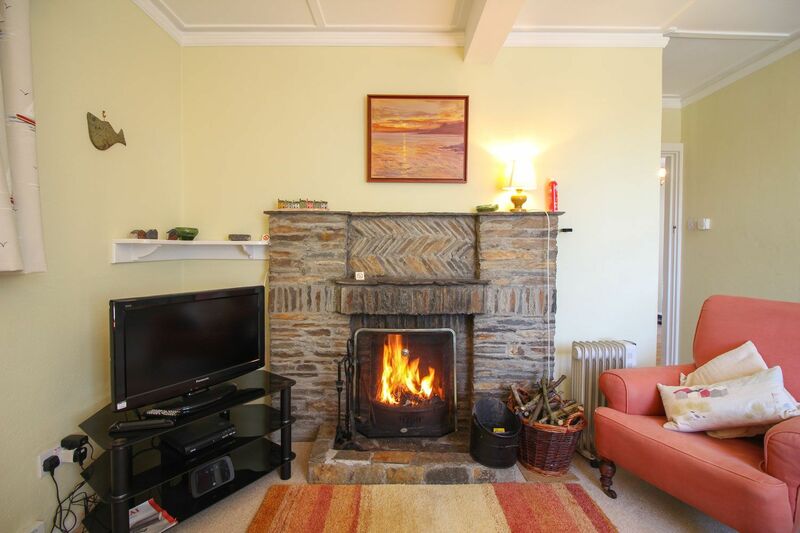 A coal fire was laid out for us when we arrived for our use and the house has central heating. We would certainly consider this house again. 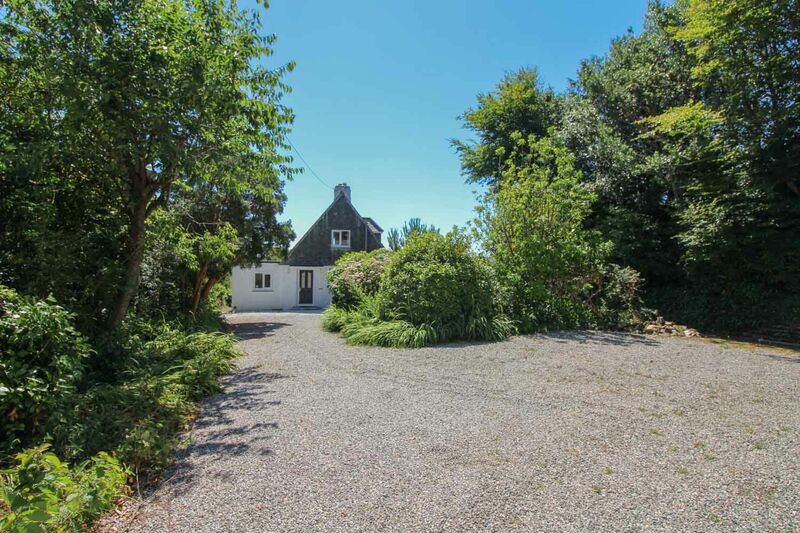 For anyone looking for a peace and quiet, to relax and chill out, you probably could not find a more suitable property. And with the nice views across a long garden you can loose yourself in a book or just watch the boats go by over a coffee. Bridget and Dennis Grange. It was our first stay in st.mawes and it was very nice. 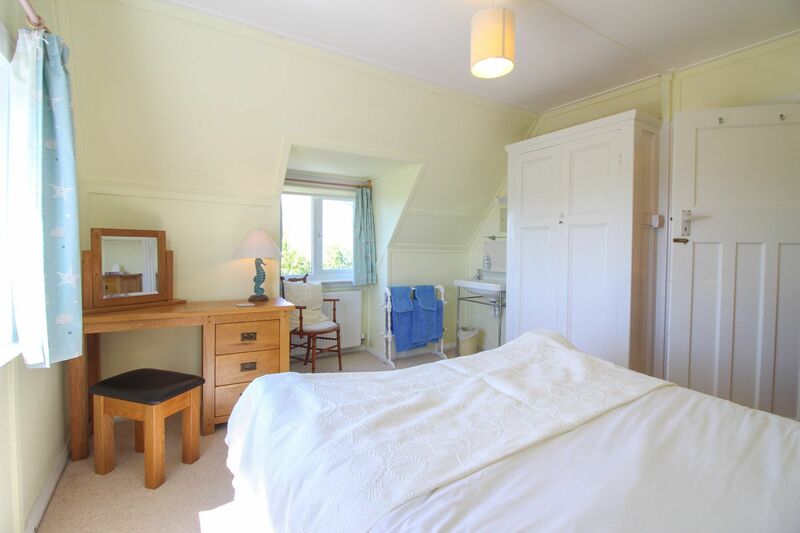 The house itself is lovely with excellent views, all beds were very comfy and all the rooms were very clean. We thought the issue of the downstairs toilet might be issue but actually it was fine. I thought the location was further down when I originally booked it, so it was a very steep walk to get home from the main village which may not suit everyone. 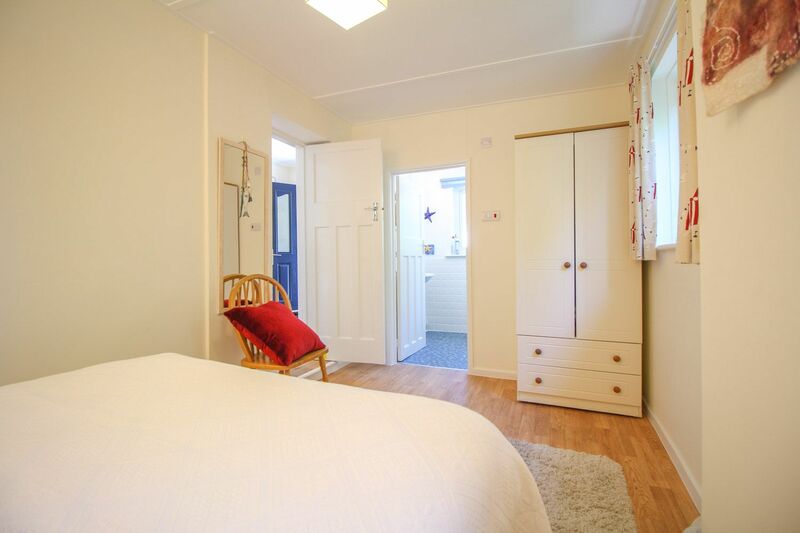 Not really any negatives though but they could do with somewhere to hang coats in the hallway and there is only comfy seating for 4 people in the lounge although it sleeps 6. 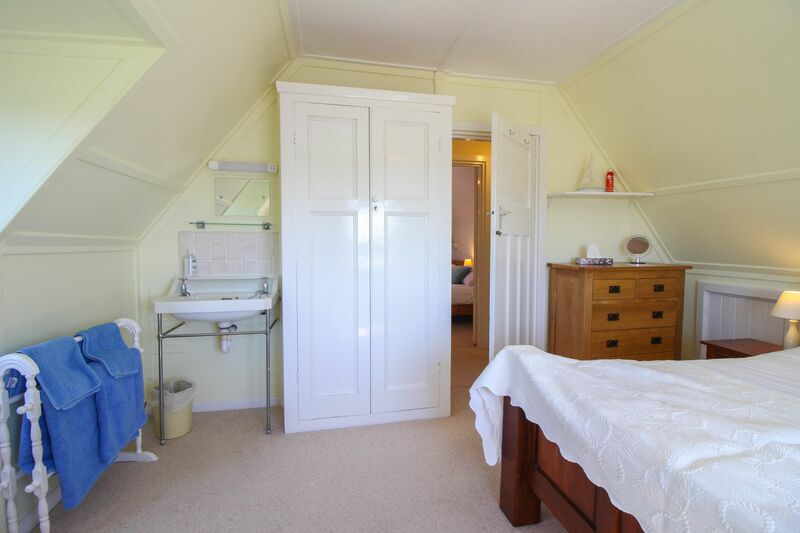 If with a family a loo upstairs for the two bedrooms would I think be an advantage as the stairs are a bit steep. Ground floor bed was not very comfortable. Nice place with good atmosphere and garden dog friendly. Reply from Sarah, Lucy & Anna Thank you for taking the time to write a review, it is a great help for future guests. 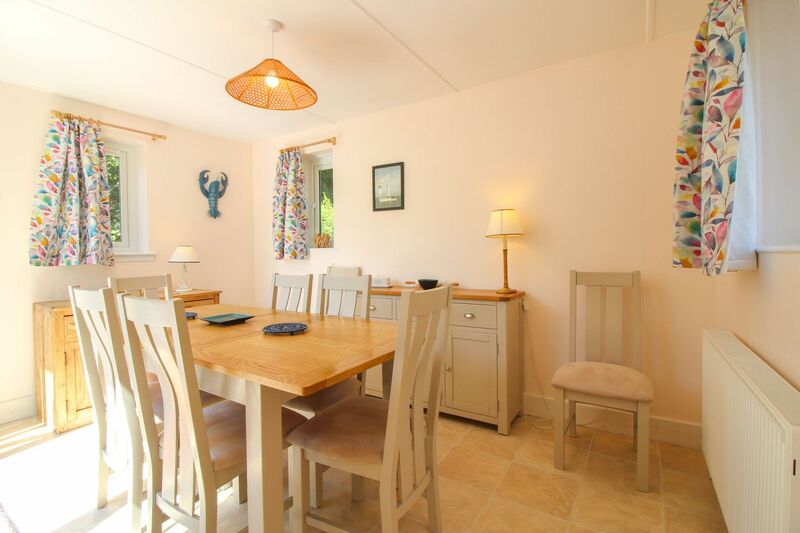 Having had Brigid's Patch in our family for over 50 years, we love to hear of our guests enjoying both the cottage and the surrounding area as much as we do! We are so happy that you had a wonderful 2 weeks and we hope that you come back to stay again some time. We loved our two weeks in this super cottage. It was comfortable and it provided all we could need. The garden is lovely - the children loved playing in the evening after a busy day on the beach. There is ample parking too. Thanks! Reply from Sarah, Lucy and Anna Thank you for your kind words, we are so very happy that you and your family enjoyed Brigid's Patch and the garden as well as exploring the beaches in the area. 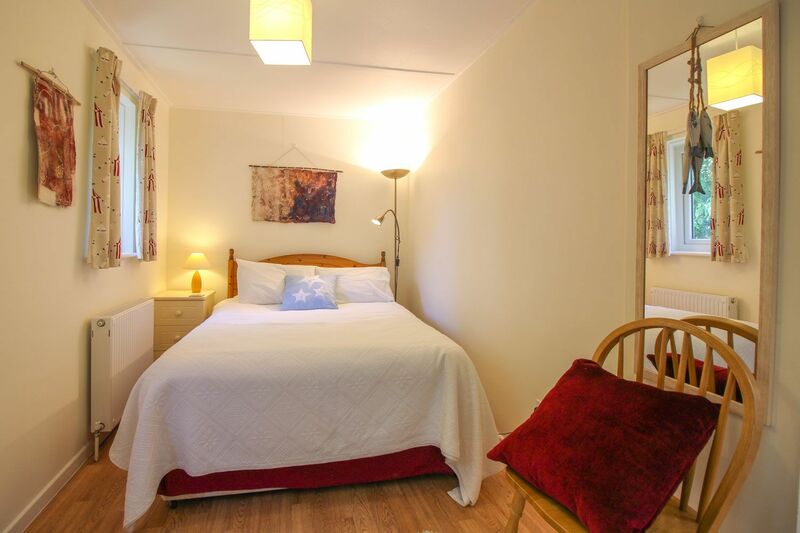 We aim to upgrade our property every year to improve our guests' overall enjoyment and comfort. Please do come again! We had a great time in St Mawes at Brigid's Patch. It is a lovely house with a beautiful garden which the children loved playing in, in the evening. 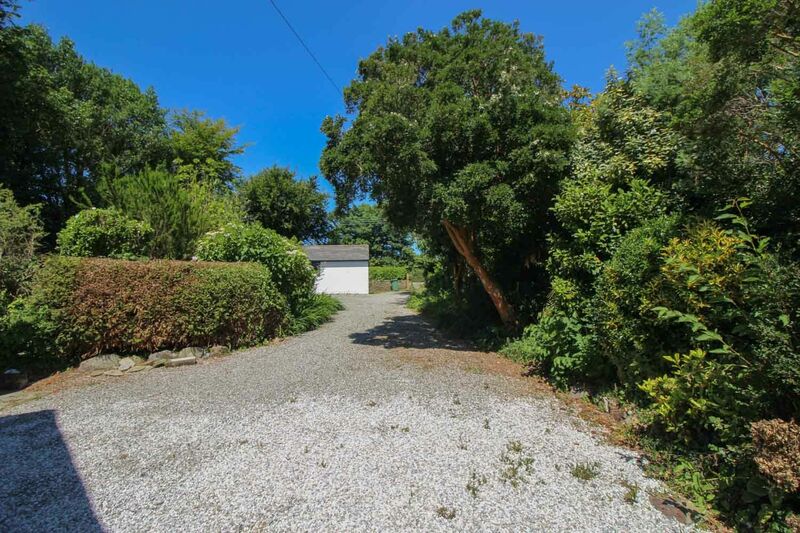 This was our third visit to Brigid's Patch,it fulfilled the criteria we have;dog friendly,car parking space and enclosed garden.The property is cleaned to a high standard,is well equipped with white goods which are new and have the necessary leaflets on how they work,some properties are lacking in these. We love the area and consider Brigid's Patch is an ideal place to stop for us. Location is quite remote so excellent if you want to get away from it all. Beautiful views but not suitable for anyone with animal allergies. Reply from Sarah, Lucy and Anna Thank you for your review. We are sorry that you found the cleanliness and condition of Brigid's Patch unsatisfactory. Brigid's Patch was deep cleaned in February including having all carpets professionally cleaned. We care deeply about the standard of our property, the comfort of our guests and have taken your comments onboard. Lovely garden plenty of parking space clean and spacios inside and very well equipped with all we needed without being cluttered. We love st Mawes. Very happy time. The cottage had everything we wanted: nice harbor view, plenty of parking and an easy walk into town. All appliances including fireplace worked just fine. The one time we needed the housekeeper's assistance she was at the cottage within 30 minutes. The caterer that Cornwall Cottages recommended was fantastic. The stairs were very steep and also had a 90 degree turn which narrows the tread.There was only a part balustrade on one side to hold onto.As a retired schools Heath & Safety Officer I would say that in its present state the property is not safe,certainly for elderly people and young children. You need to have a hand rail fitted to the wall on the left side for the full length of the stairs ( looking up on the left side. )The side with the part balustrade also needs a hand rail extension. A notice needs to be displayed near the stairs advising there is a hazard and care is needed. If there was an accident the owners could be judged as responsible and may have problems with insurance. 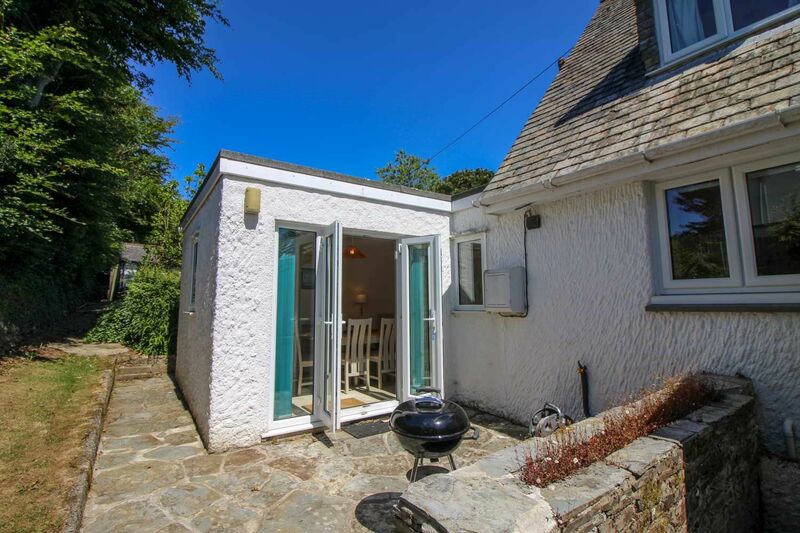 We had a lovely stay at Brigids Patch, the cottage is in a stunning location with beautiful sea views, the cottage itself is very cosy and beautifully presented with St Mawes Village being only a short walk away. The gardens are also beautifully and immaculately cared for which our American Akita Phoenix thoroughly enjoyed, the only issue that we had during the week was that Phoenix almost escaped from the rear corner of the garden, we used a beach wind break to temporarily secure the garden, a better fence would be recommended to make the cottage truly dog friendly. 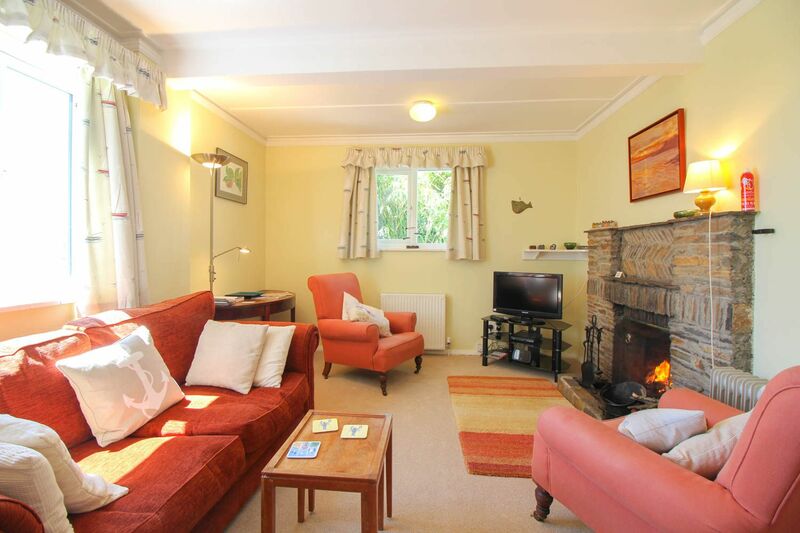 I would thoroughly recommend this cottage to anyone. We have had a lovely two weeks in a comfortable and well-appointed house. It was clean and warm and the facilities were excellent. We will come back! We enjoyed our holiday at Brigids Patch: From our point of view the position was excellent, plenty of room to park the car and good access from the road and being on the flat meant that the clutch didn't suffer as much as other holidays in Cornwall.The fact that the key was on the premises was also an added bonus as were the explitit details of how to reach the property. The welcome pack was also good no wondering how equipment worked! We had 2 dogs with us and the garden was enclosed although we were worried about the smaller one getting through the gate and blocked of the front garden using garden chairs of which there were plenty. We played Scrabble first time for many years and would put in a plea for new box of Dominoes. It didn't bother us but I can see that the stairs are a bit steep and also that there is no upstairs bathroom although I can see why! Perhaps I should finish by saying we are thinking of making a return visit next year. 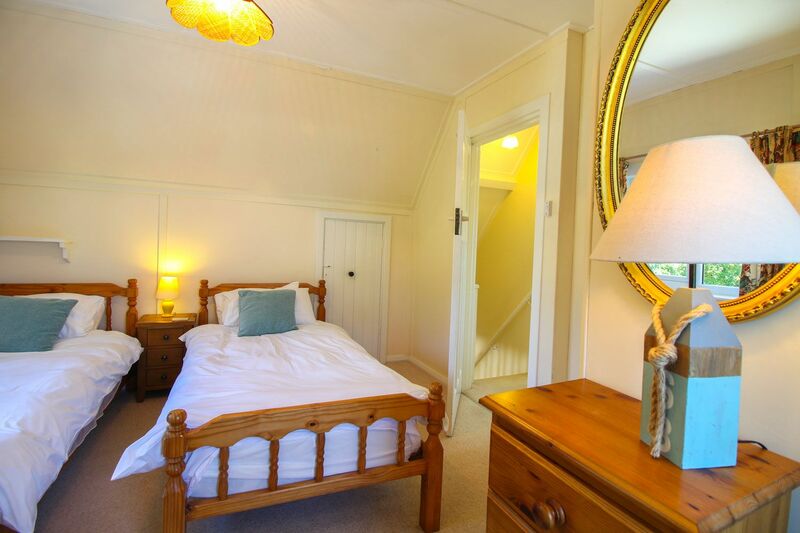 We had a wonderful stay the house was clean a d welcoming on our arrival with beds immaculately made up and plenty of towels, a comfortable house in lovely location we would certainly return. 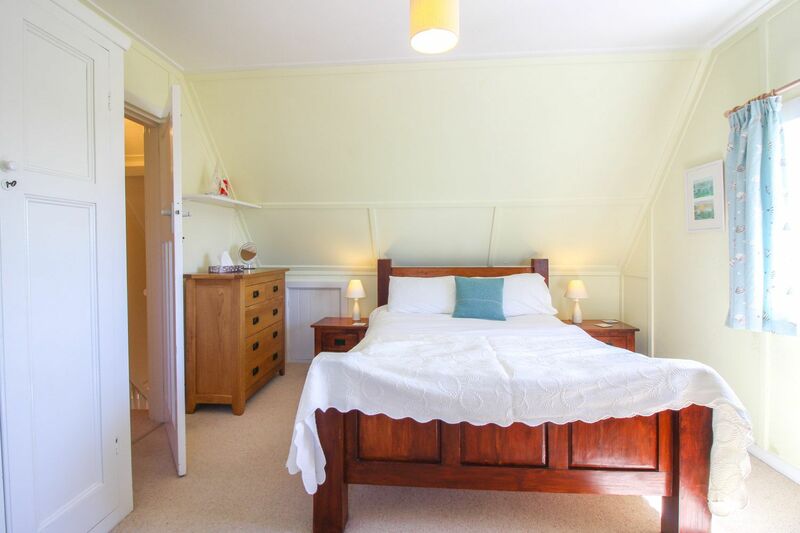 May I suggest some comfortable lounger type chairs for the garden and a bit more storage in the shape of a larger chest of drawers in the bedrooms, these are I know minor things but thought you might like to know. Thank you for the opportunity of being able to use this comfy house. 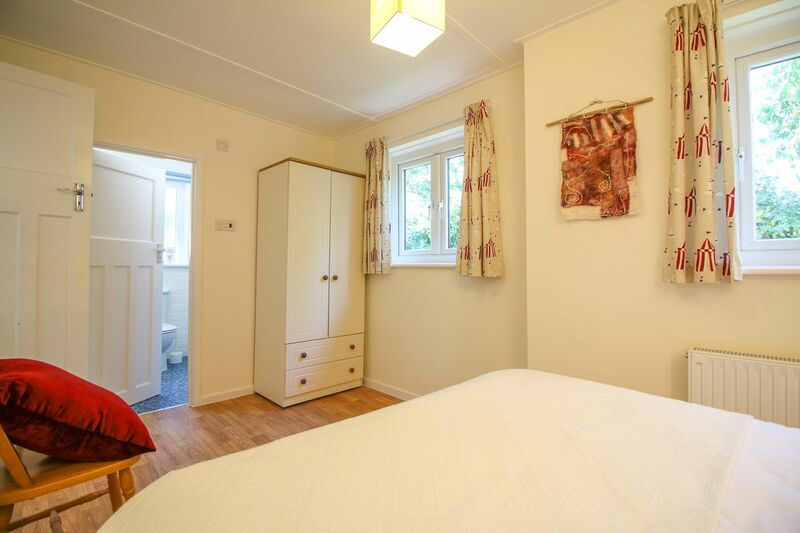 A very clean and comfortable property. 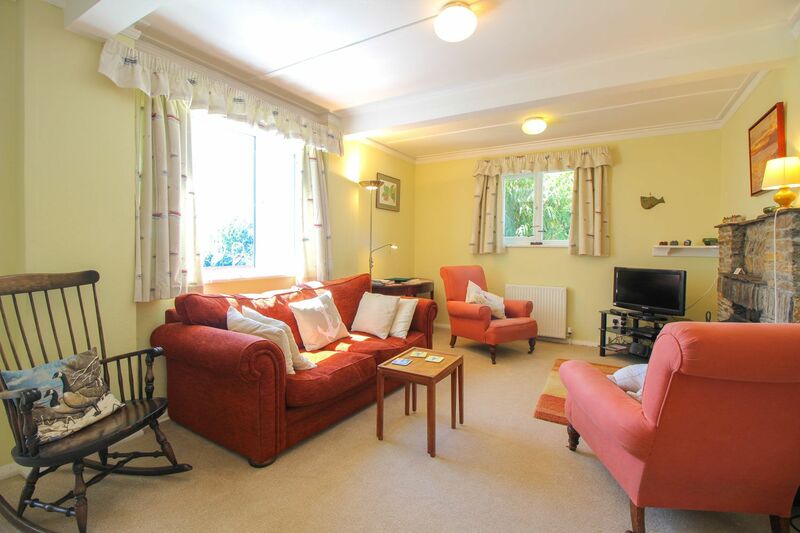 If you want a property with great character and modern facilities I would highly recommend. Heating and hot water system is first class. 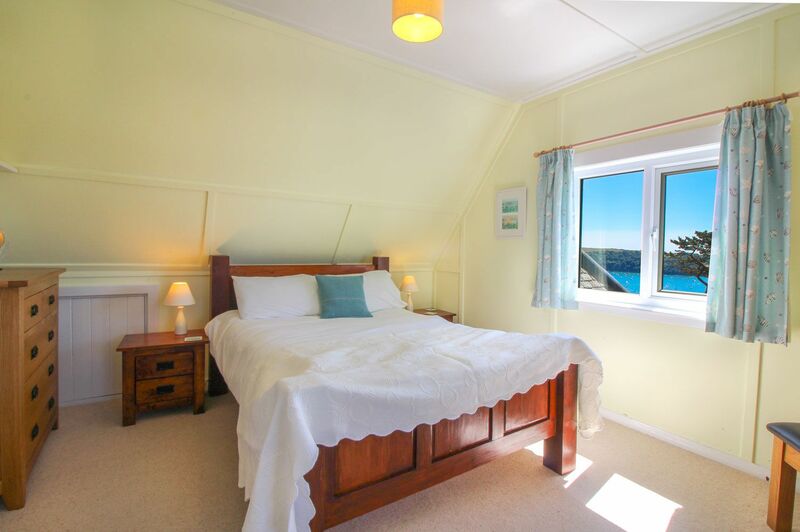 We loved the summer room and its great views overlooking St Mawes estuary. Six of us stayed and the down stairs space suited us well as we were not on top of each other. 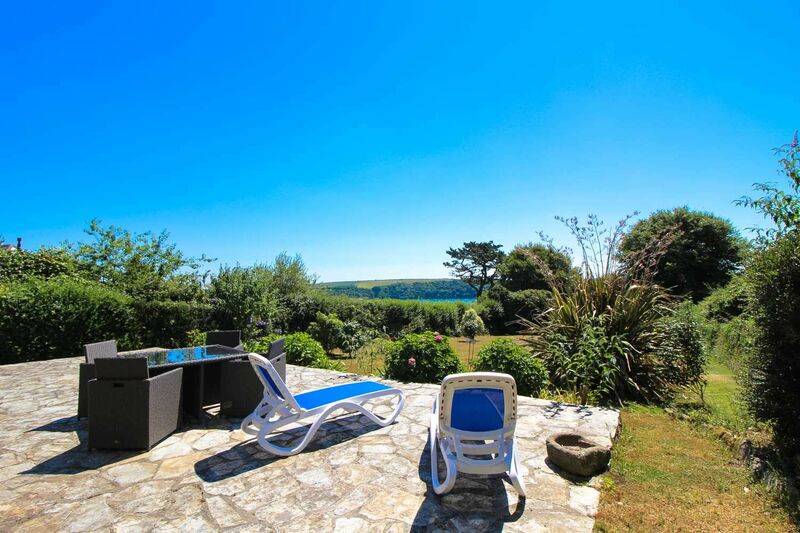 The location of the house is wonderful as are the views. For the price paid house could do with some t.l.c. and cleaning in the corners! Very comfortable beds. 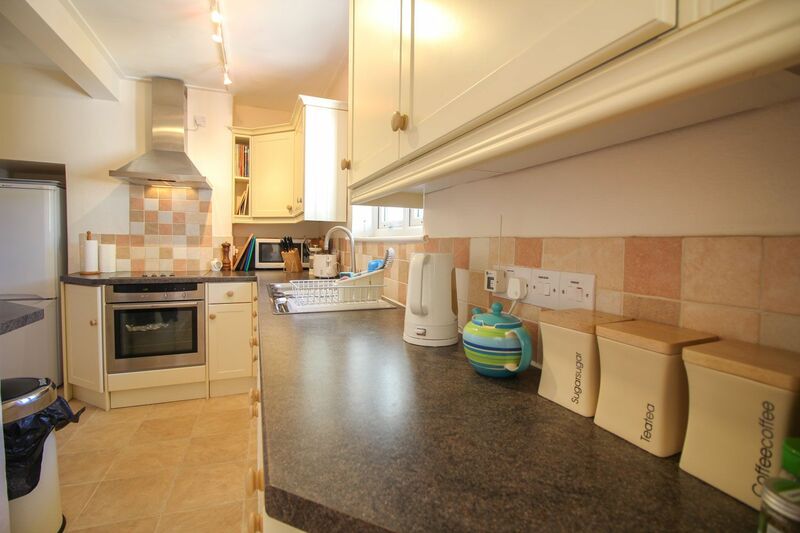 Kitchen well equipped but cupboards and utensil drawers need sorting. Found very old beyond mouldy chocolate cake in a container in kitchen cupboard! Can't have been checked for months. Lots of tables and chairs. Very steep and slightly alarming stairs leading down from bedrooms, not suitable for the elderly and should be noted on the description, made worse as all bathrooms and toilets on ground floor only, which should also be noted more clearly on the description. Lovely garden. 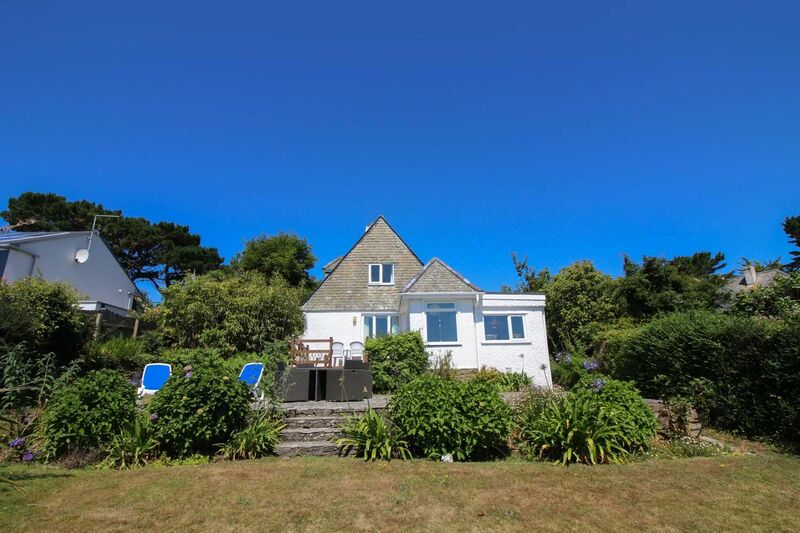 Would recommend this property to others only for the location and views, which are wonderful. We had an excellent week...the cottage was fantastic. The children loved it, especially the garden. 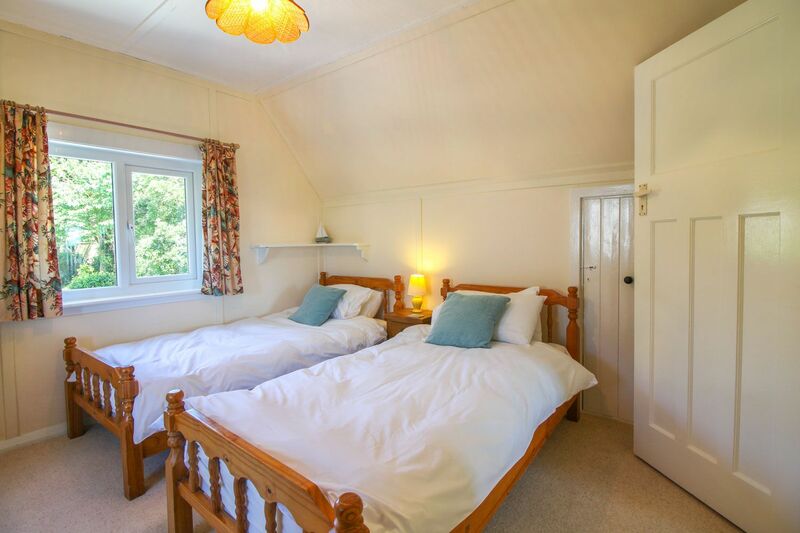 Would definitely recommend the cottage to anyone considering staying there. 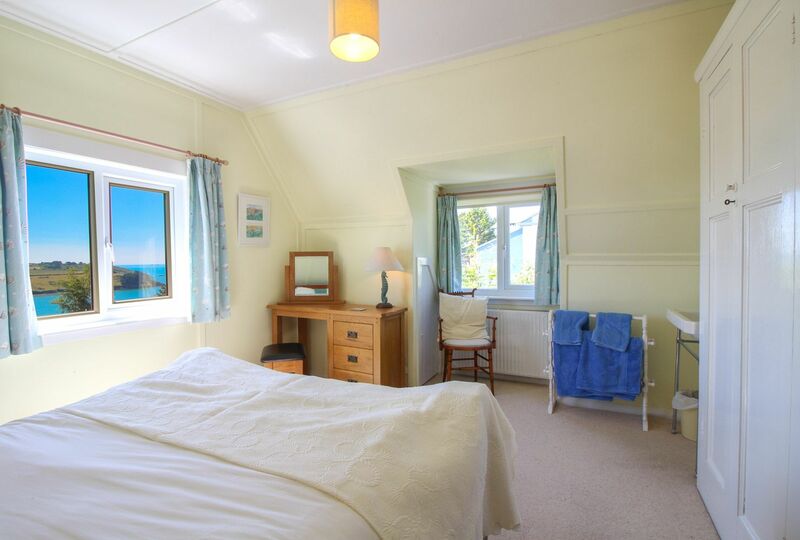 A wonderful stay in a lovely house with beautiful views. The family enjoyed the garden and patio too. The facilities were excellent and it was good to have useful parking space. 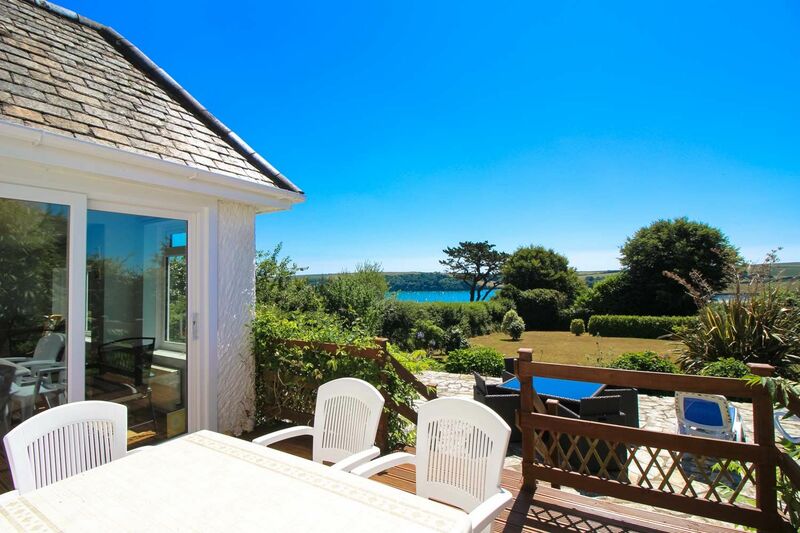 The location was amazing as is St Mawes. The property itself feels tired and dated and could do with modernising and a deep clean as there is a lingering smell of damp/mould/dust. Enjoyed our few days in the cottage with one or two comments: No folder of information was left out for us, we had to look for it and found it in the desk in sitting room. No 'basket of coal' as detailed in folder was left for us ( although a quick phone call to Maria rectified this ) We found the stairs steep but gradually got used to them! Sofa badly in need of attention as the right side has completely 'collapsed'. Carpet in sitting room tired and badly stained in places. 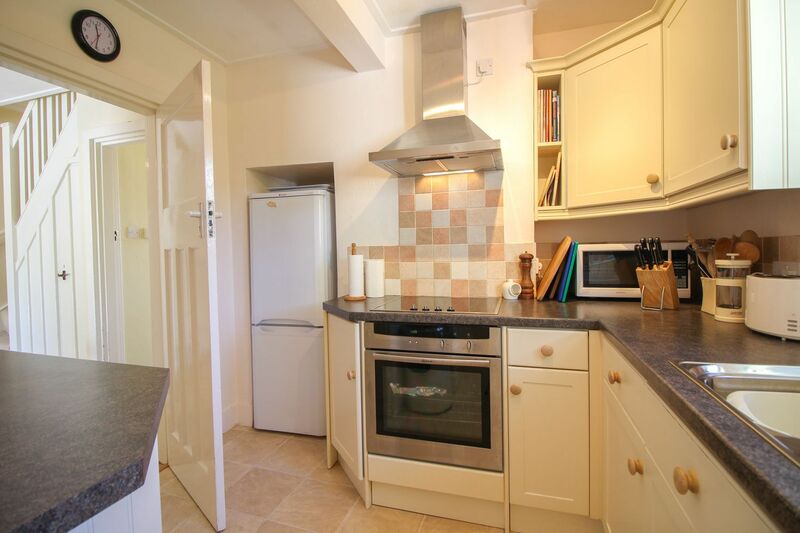 Good points : warm and cosy, good range of kitchen utensils and very good cooker. 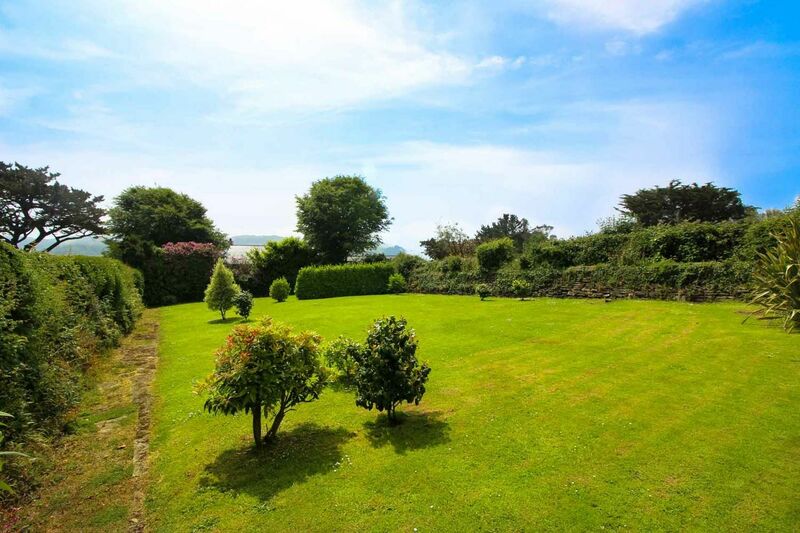 Wonderful garden which must be great in the summer , fantastic views especially from upstairs, good private parking area too. As there were only two of us, Brigid's Patch may not be the most economical place to stay. I also question the £25 charge for each dog and wonder how this can be justified as it certainly does not cost an extra £75 ( in our case) to return the house to cleanliness, especially since two of my tiny dogs are non moulting ! We had a fabulous time at Brigids Patch, thank you. It was absolutely perfect! The entire experience and overall the cottage was superb. 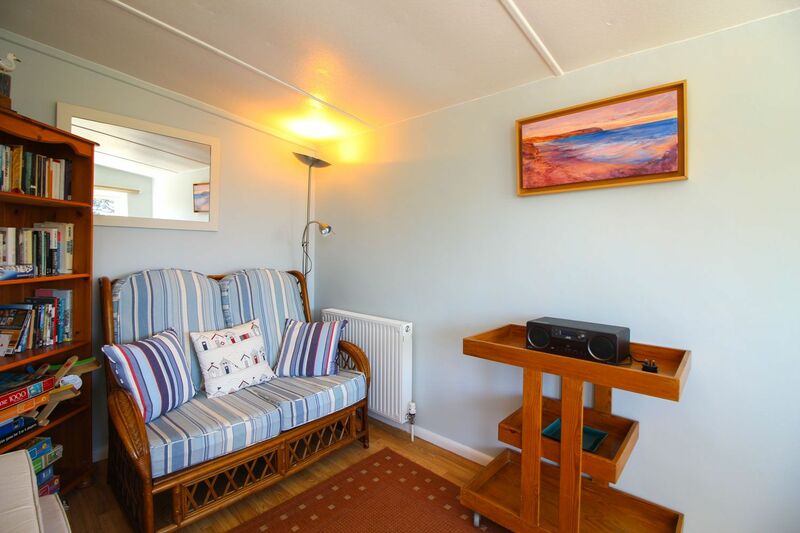 There were too many small touches to count that showed pride in the property, as well as a canny sense of what people who were looking for a self catering let would want and look for. Also, being able to walk to so much was an appreciated bonus. 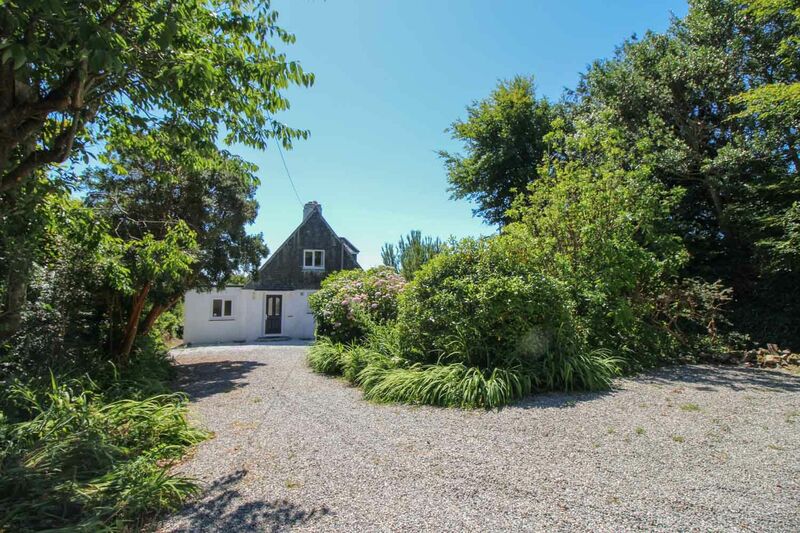 We will certainly give the cottage our heartiest endorsement and certainly let friends who want to go to the area know about it. The house is really lovely, so well laid out and equipped. 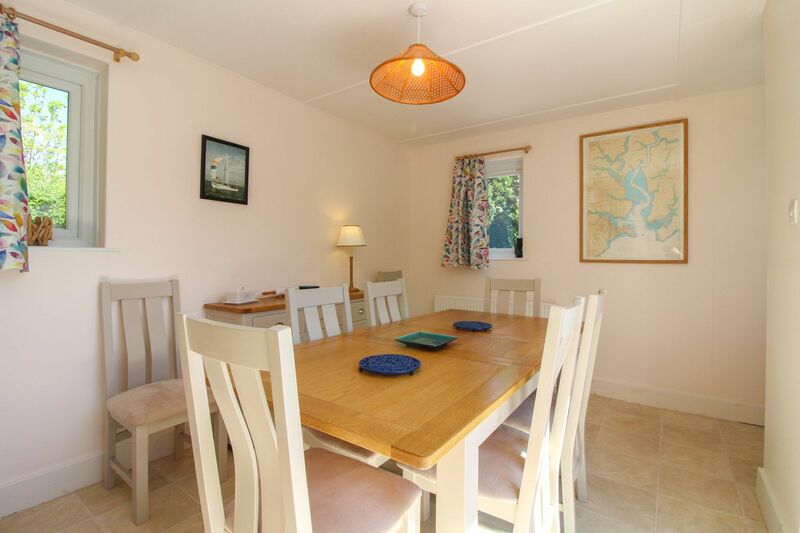 Best bits for us were having a downstairs bedroom with en suite, a garden room where you could sit in the warm and see the estuary and the boats, the big garden for my spaniel, the open fire, great views from the back bedroom over the water, a very well equipped kitchen which made it a pleasure to cook and eat at home some evenings. Nothing I can think of that would have made it better for us. Brigids Patch is a comfortable holiday home in the spirit of My Family and Other Animals, but with updated kitchens, showers and heating. 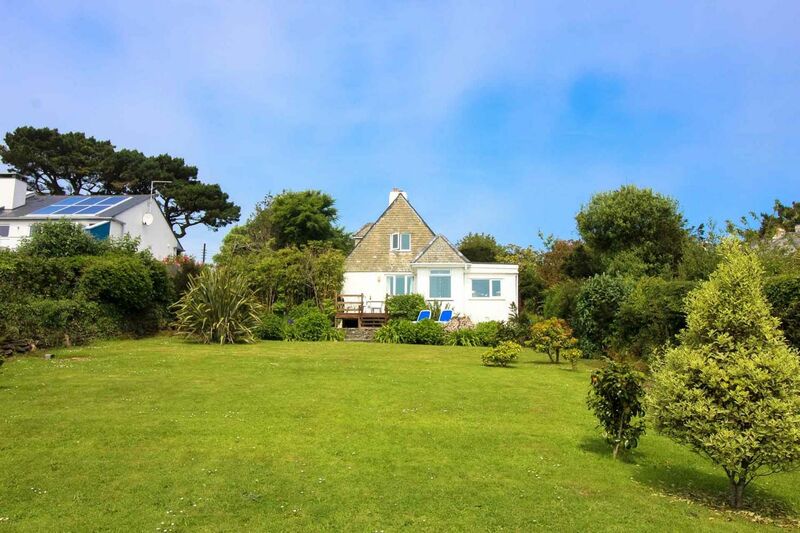 Perched on the edge of St Mawes a little way above the Castle, it commands beautiful views across the bay and is a short walk into the fishing village. 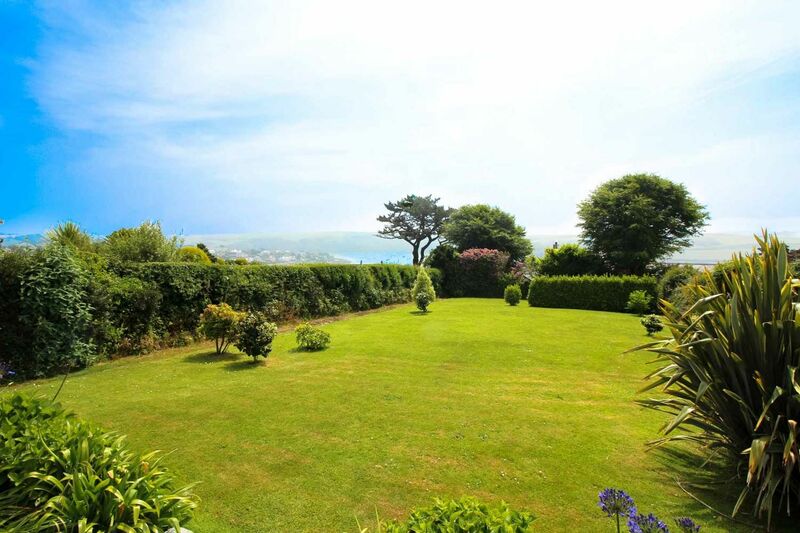 We really enjoyed our stay and found the house very suitable for us; particularly its garden and views. The views from the back of the house are wonderful. 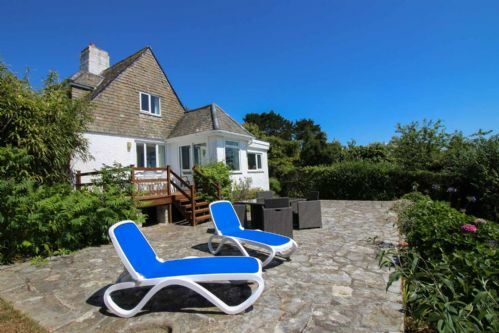 With its elevated position overlooking Summers Beach and the Percuil River, views toward the St Anthony's Lighthouse and the Lizard, its extensive private gardens and delightful south facing terrace, Brigids Patch is one of the prime self catering holiday homes of St Mawes. 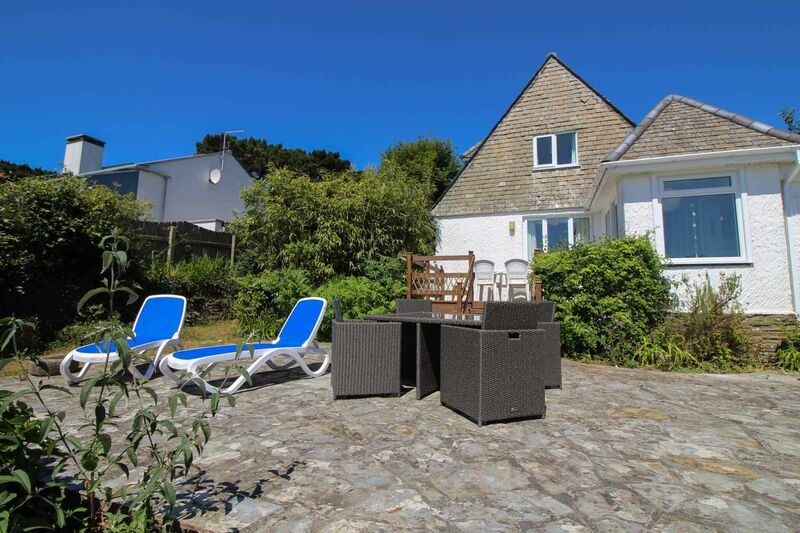 It is an 8-10 minute walk down to the St Mawes harbour area with its good range of facilities including butcher, baker, chemist, Co-op convienience store, post office, pubs and a range of hotels. 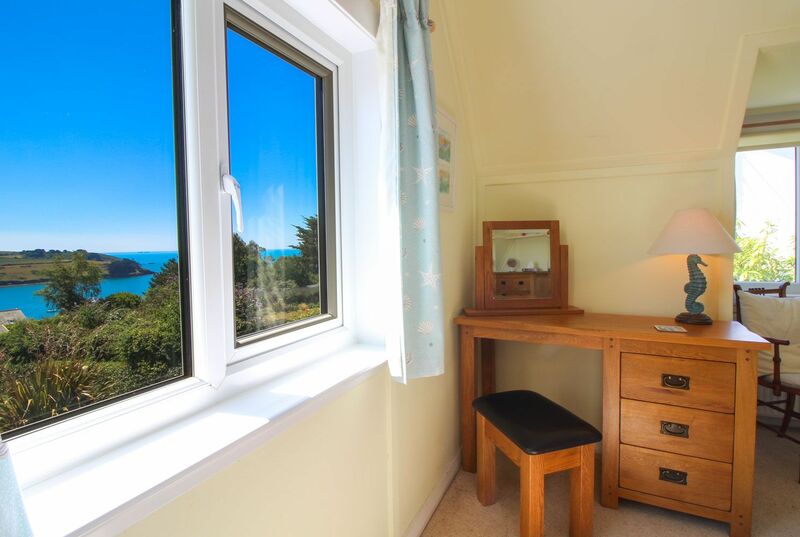 It is no more than a 2 minute walk to the famous Lamorran Gardens or 5 minutes to St Mawes Castle and views over the spectacular Carrick Roads. 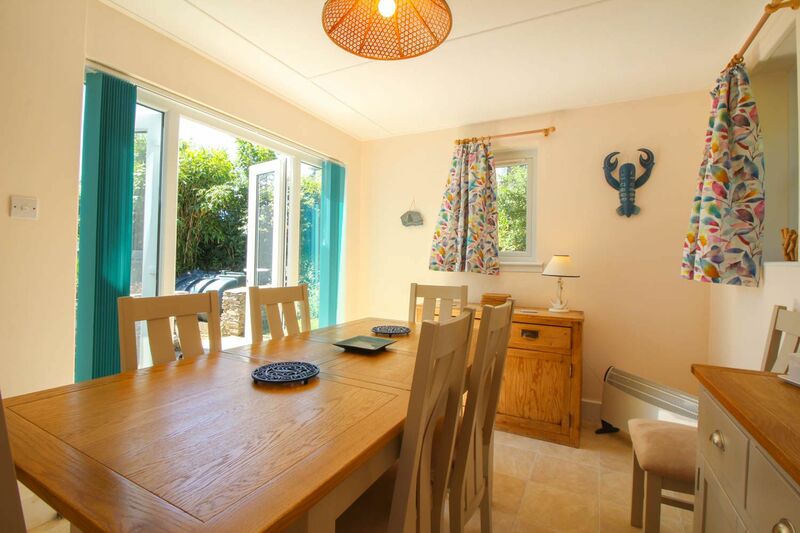 Brigids Patch was completely refurbished during the winter of 2009 and is a wonderful 3 bedroom holiday home. 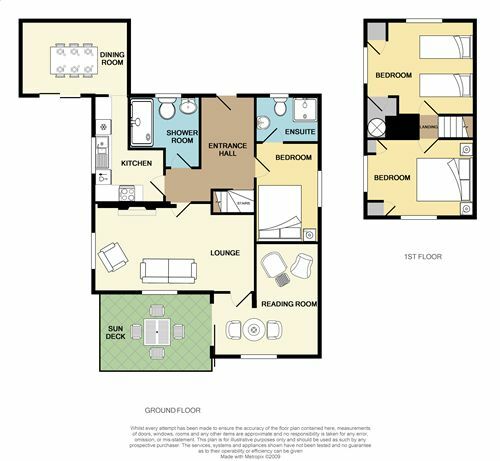 It is a good sized house, ideal for families or small groups of friends, but not too large that a couple would feel uncomfortable staying here. 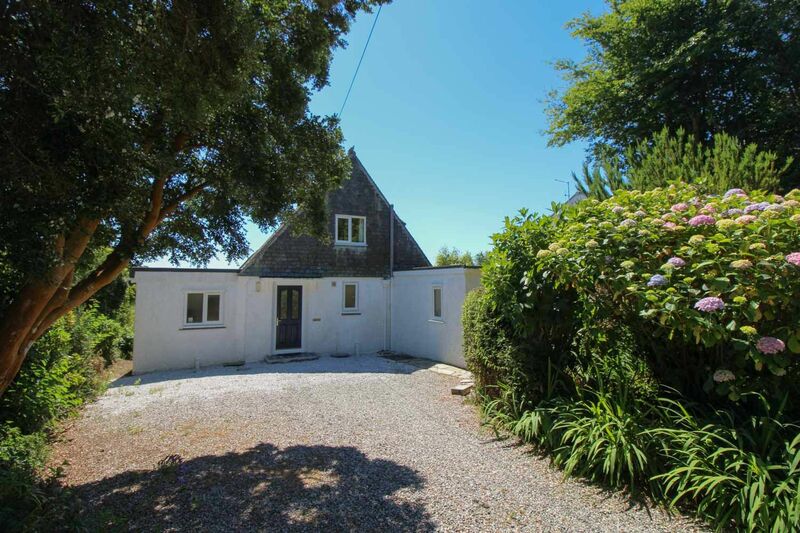 The property is private and therefore offers a great retreat whilst being within walking distance of all the facilities of the village. 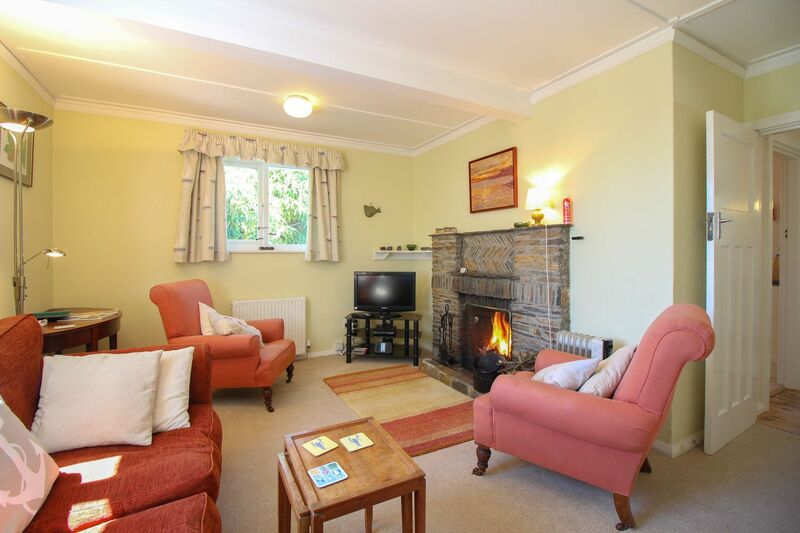 With an open fireplace, double glazing and central heating, Brigids Patch is also a fine place to stay during the winter There are some fine walks to be had from the property. Of particular note is the walk to St Just in Roseland and its delightful church and cemetary. You can easily reach the start of the footpath from Brigids Patch which descends and joins the coastal path north for about 45 minutes to St Just Creek. 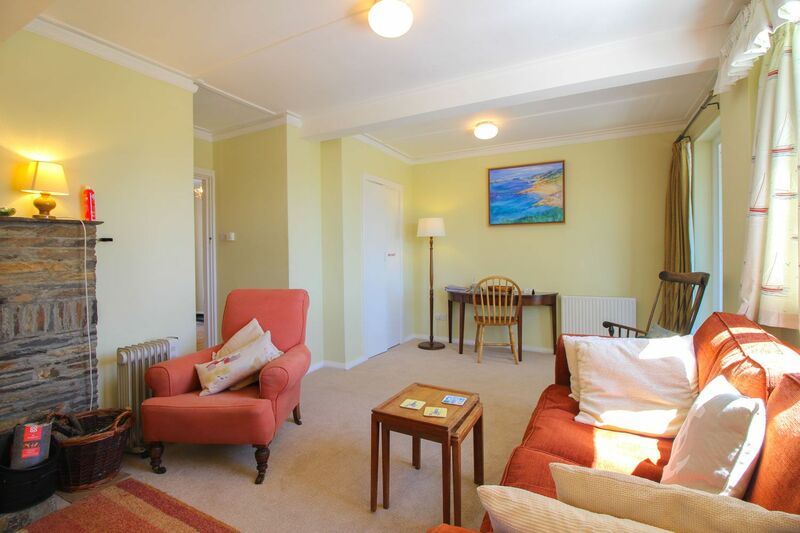 Ground Floor: The main entrance hall leads to the south facing living rooms with access onto the spacious terrace. 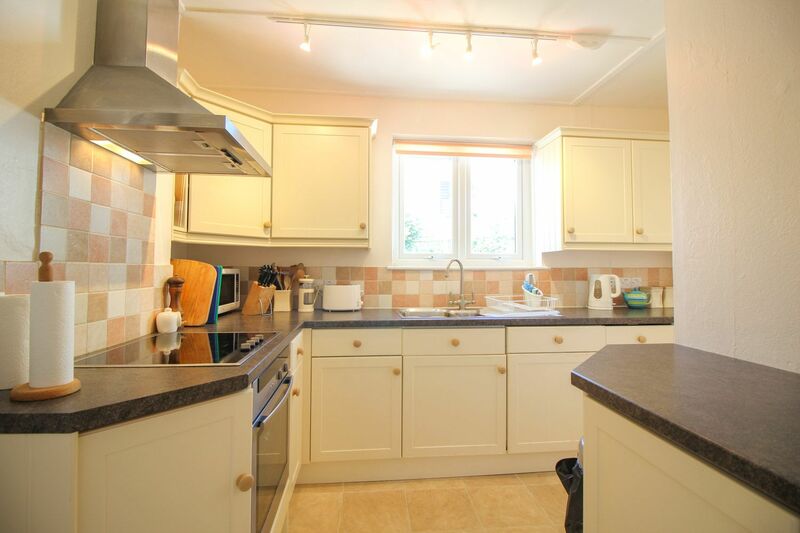 The fully fitted kitchen is to one side with a dining room leading off. 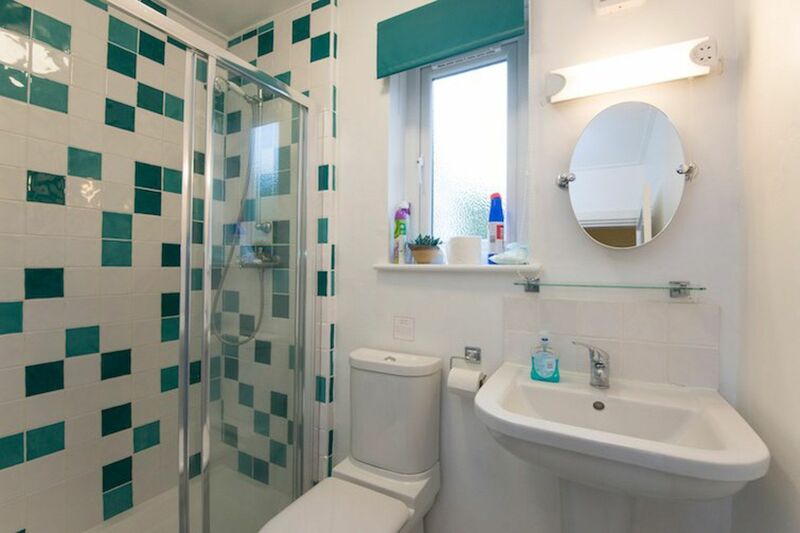 A double bedroom is located on the ground floor with ensuite shower & WC. 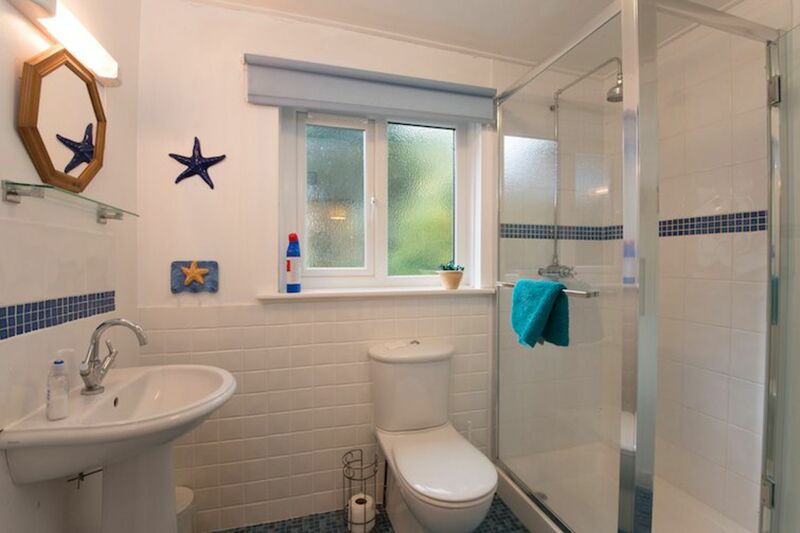 The family shower room is also located on the ground floor. First Floor: Two bedrooms: one main double room with hand basin and fantastic views over Summers Beach and the Percuil River with a further larger twin bedded room, also with hand basin, to the rear. 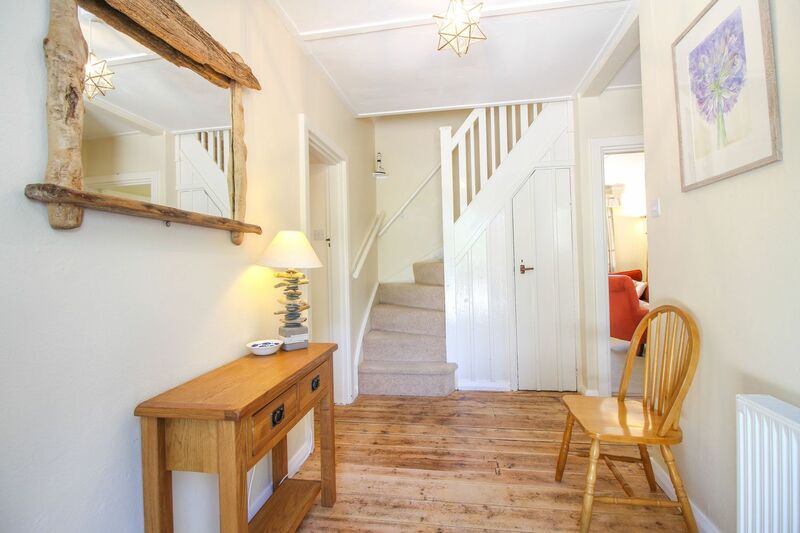 Access to the first floor of this 1920's cottage is via a steep stair case with only a partial hand rail, due care and attention needs to be taken. 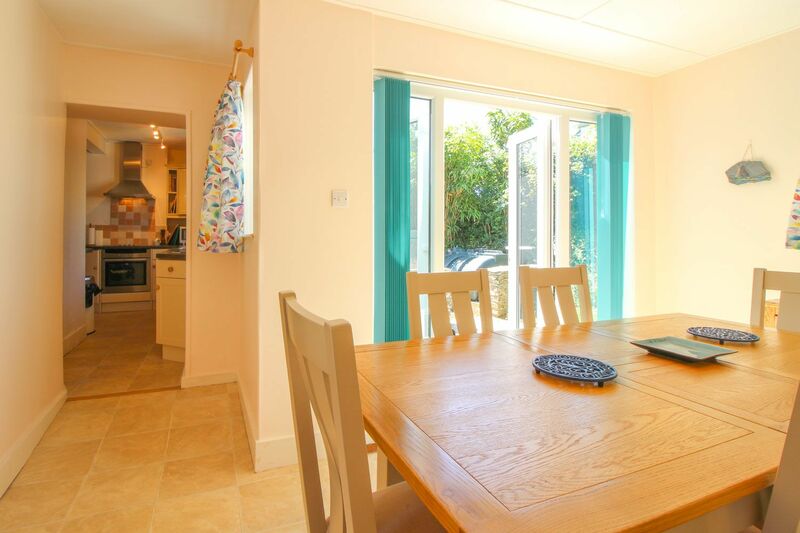 Exterior: There is a superb deck, patio & long south facing garden with outside furniture & a BBQ. 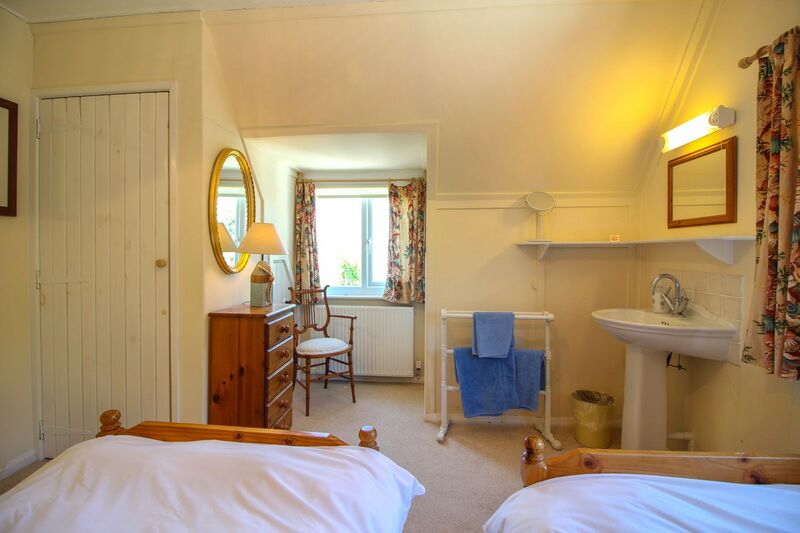 Electricity, heating, bed linen & towels are all included but you will need to bring your own beach towels. 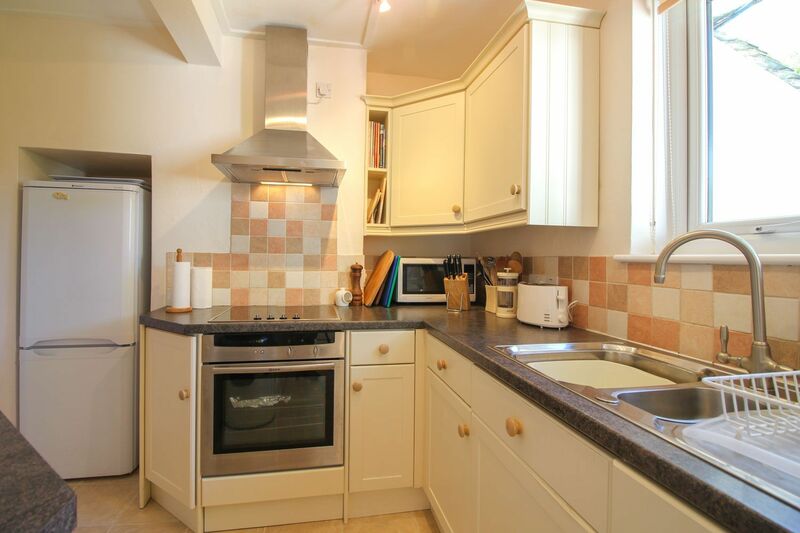 The kitchen is fully equipped with oven, hob, microwave, kettle, toaster, dishwasher, fridge & freezer. There is a washing machine/dryer. There is WiFi available at the property. 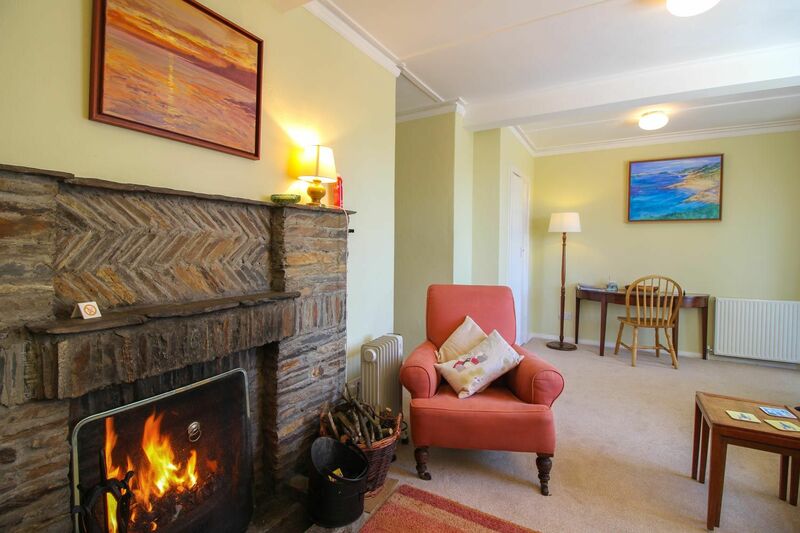 The lounge has a TV & DVD player and open fireplace. There is parking for up to 4 cars on the large driveway. Please note that the hill down to the harbour is quite steep. We regret that no smoking is allowed at Brigids Patch. Well behaved dogs will be permitted at a small additional cost of £25 per dog / per week although please remember that you cannot leave dogs unattended in the cottage alone. 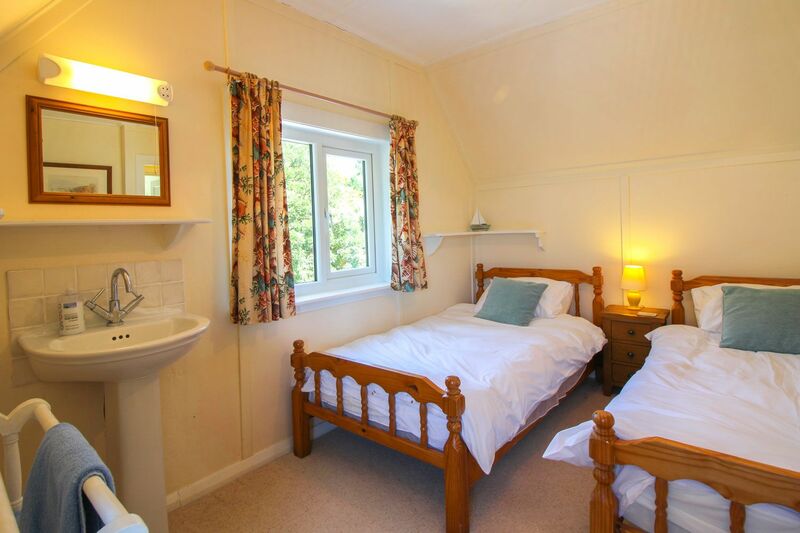 Discounts available for couples staying for 7 nights outside the peak season, using just the one room. 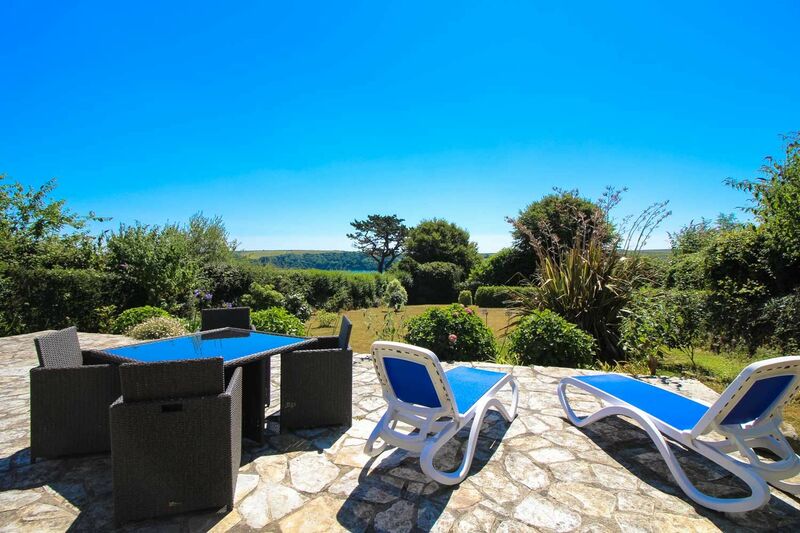 An architect designed reverse level luxury 5 bedroom house set in landscaped gardens with a first floor balcony offering stunning views over St Mawes Bay, the village and distant coast and countryside. 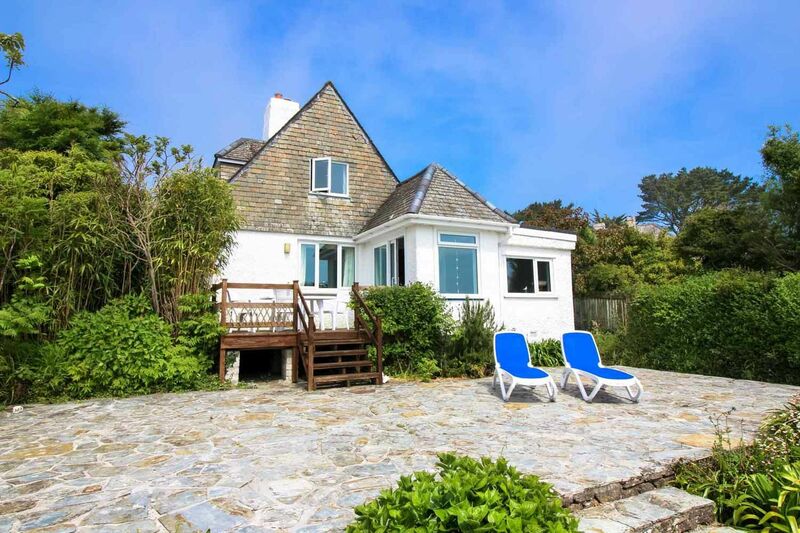 On the sea front with stunning views across to St Anthony lighthouse and the Lizard peninsula, Tavern beach is literally just across the road which at low tide extends into a sandy beach. In the summer there is a bathing platform moored just out to sea.